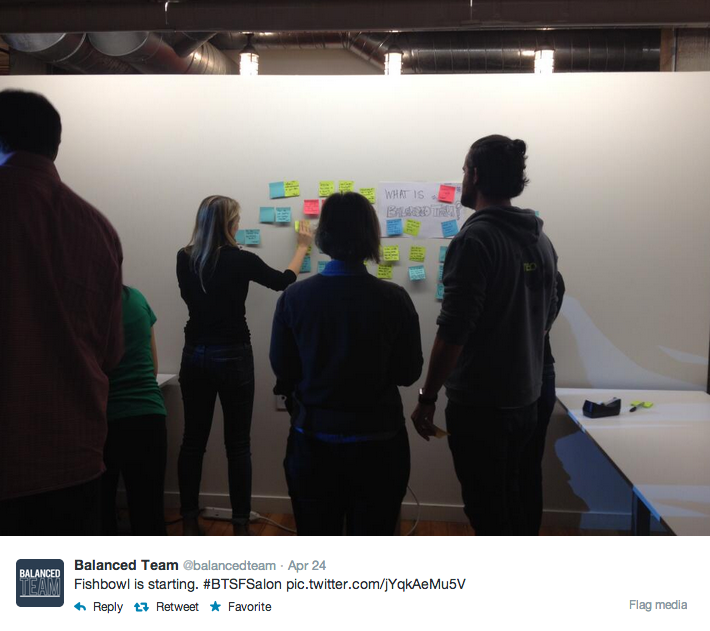 There has been a great deal of recent momentum with the Balanced Team folks. A clutch of long time members gathered recently for the Lean UX NYC conference followed up by a Balanced Team Salon hosted at Pivotal Labs. Several of us shared a desire to carry some of that energy back with us to the west coast. Initially this felt like a good opportunity to round up some of the BT friends in San Francisco for a night of cocktails and conversation. After a couple conversations among several folks we decided to change course, put some structure around it and turn it into a Salon. Salons have proved themselves to be a lightweight version of a larger un-conference event. At this Salon in San Francisco we had several lightening talks recounting some highlights from the New York experience by Courtney Hemphill and Alexa Roman. We then opened it up to our favorite tool for engagement – the fishbowl. 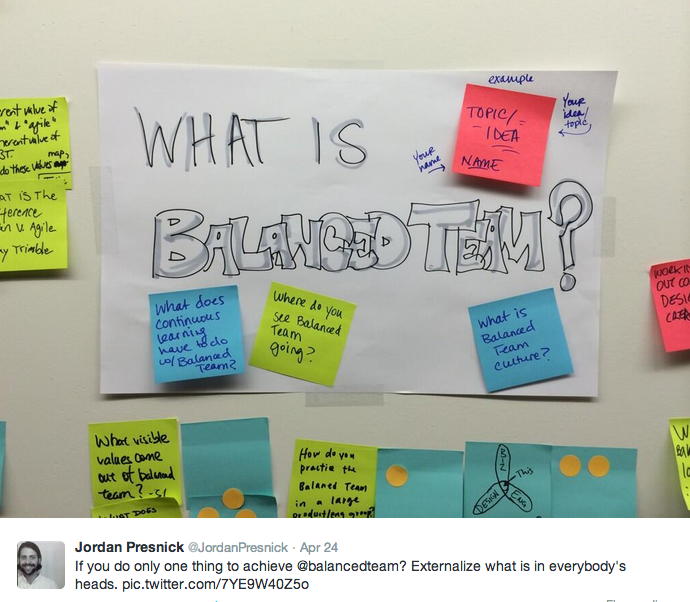 We seeded the endeavor with a broad question open to lots of interpretation… What is Balanced Team? As there were several new faces, there was a good amount of fodder for the bowl that followed. The question that received the most dot clusters was the topic on everyone’s tongues: How does Balanced Team fit into organizations: top down or bottom up? For those of us that have confronted this problem, it was easy to surface the issues and throw around some stories of experiences and the learning that was captured from them. The one truth that we can all agree on is that it is invariably hard but always worthwhile. As to be expected, the secondary and perhaps more important component of the event was the time available for old friends to reconnect and talk about their work and passions. A latent issue that at times would surface during the conversation was the lack of true balance in the attendees at large. We are all practitioners on the design and development side of the product creation process. The missing voices that have the potential to truly balance our work still felt either underrepresented or fully absent. The knowledge, needs, and ideas that come from those working day to day in the fields of ethnography, marketing, sales, business strategy, etc are critical components to the successful execution of ideas. I very much hope to see future Balanced Team events reaching further and further out into our extended networks to bring those voices to the conversation and ignite the future fishbowls with some lively discourse. Here are some additional photos courtesy of Alexa Roman.